Last and First Men is a prime example of the science-fiction genre known as “future history”. Spoken in the words of one of the “Last Men”, communicating with a person from (Stapledon’s) present, it reads more like a history book than a work of science fiction. And yet, the book is a cornerstone in the history of SF. The story spans a huge time-scale; the author uses the metaphor of an airplane making a flight over a landscape, sometimes slowing down the flying lower so you can see the details, but in the most part you see mainly the general outline. For a book describing no less than 2,000,000,000 years of history, this is a reasonable approach. At first, the level of detail resembles that of regular history books, telling the story of First Men (us) until its very end in rather fine details. The storyteller’s “airplane” slowly accelerates, though, and some of the later human races are mentioned only in a passing. Sometimes the lives of a few individuals are described over several pages, but sometimes, whole eras -- millions of years -- pass by in a few paragraphs. Given the nature of the story, there are obviously no leading characters, nobody that the reader can identify himself with. This can be contrasted with Clifford Simak’s solution to the same problem, in City (reviewed here), where he creates the role of a “hero” over a large timespan by following the history of a family. Naturally, this narrative device can be used only to a limited extent; in the case of Last and First Men, it seems inapplicable. The book begins shortly after then end of World War I (it was published in 1931, a few years before WWII). The narrator mocks the then-common demagogy, that WWI was “the war to end all wars”. It slowly unfolds how many more wars were fought, until an “ultimate weapon” was developed, dooming civilization as we know it. This was the first, but hardly the last, time that mankind almost destroyed itself; at one point, humanity was reduced to eight living individuals, members of a research expedition that were saved from another terrible weapon. Mankind also changes with time, and the reduction to extremely small numbers makes evolution possible. We, the First Men, are replaced by the Second Men, Second by Third, and so on, race replacing race, yet they are all, to an extent, human. Some are more intelligent and capable; others have much lower intelligence, degraded forms that (in some cases) became extinct. The Last human race, by the way, is the eighteenth in number. With the exception of those weapons of mass-destruction, Stapledon’s fiction hardly includes any technical details. In fact, one might think Stapledon didn't ignore the notion of technological progress, but rather that he overlooked it: for the next four millennia, mankind’s technology is supposed to be coal-based. And when the Earth had no more coal, a “dark age” much longer than the recorded human history began. The only details of progress are those of human evolution. There is physical evolution (one subrace actually developed flight, and Stapledon’s description of the resulting culture is fascinating), but of much greater interest is the mental evolution of the race. To be fair, though, just as the technical progress described is far from being hard-core, so can the details of evolution be easily criticized as far from realistic. 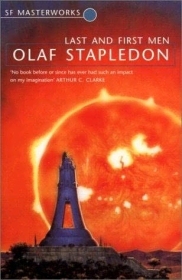 Surprisingly, though, Stapledon’s aliens (mainly the Martians, less so the natives of Venus) are different and original, and cannot be dismissed as the “impossible” or “parallel evolution” variations that were so common in the science fiction of the time. The most important aspect of the book is its attempt to put mankind in place, with regard to the whole universe. In some ways, reading it is like a travel in Adams’s “Total Perspective Vortex”: you understand how small every single person is, and even how small is mankind as a whole. If taken in the right way, this can be a most educational, philosophical experience; and it is mainly for this reason that the book, a “dry history textbook” as it almost is, is worth reading.